This article is part of The Immigrants’ Civil War. Scroll to the bottom for a complete list of articles. The 1st Louisiana Tigers Special Battalion was a unit mostly composed of Irish immigrants. They hunkered down in the dense bushes on the west side of Bull Run, a small Virginia stream, on the morning of July 21, 1861. 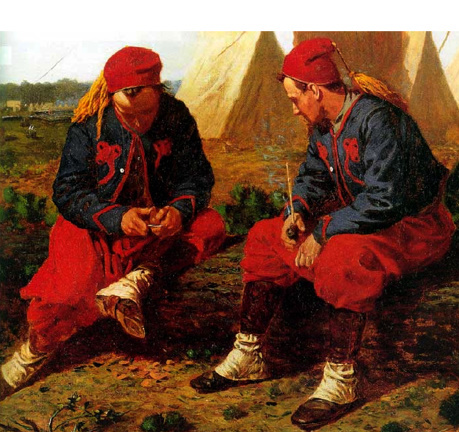 Up close they were quite a sight: Among the most colorful units on the field at Bull Run, the men dressed in the uniform of the Zouave, and looked like Berber troops in French North Africa. The Battle of Bull Run was essentially a fight between two gaudily dressed and heavily armed mobs. Lincoln’s army, raised in April following the Confederate attack on Fort Sumter, was about to disband. Soldiers had enlisted for just 90 days, and many units would be ending their terms of service before the start of August. If the army was not used quickly, it would dissolve before its first battle. Soldiers head off to Bull Run in uniforms of all designs, many dressed in the garb of French Berber troops from North Africa called Zouaves. Union Zouaves are depicted in this painting by Winslow Homer. There were only six Polish soldiers in the Louisiana forces, which is surprising considering that two Louisiana regiments were designated as Polish. One of those regiments, the 15th Louisiana, was misnamed. Called the Second Regiment of the Polish Brigade, it included virtually no Poles, and there was no Polish Brigade in the Confederate Army. New Orleans in 1861 had fewer than 200 Polish immigrants in the whole city. The Tigers were desperately outnumbered, but their commanders knew that if they did not hold the Union army up, the Northerners would crush the poorly deployed Confederate line. The New Orleans men took up a defensive position on Matthew’s Hill, forcing the Union troops to deploy for battle and lose precious time in their race to collapse the Confederate left flank before General Beauregard, whose headquarters was miles away, even knew he was under attack. It would be two long hours before the Confederate high command understood the dire situation it faced. Could the Louisiana Tigers and the few nearby supporting units hold out? At first the situation must have seemed impossible. From their elevated position they could see regiment after regiment marching towards them. Soldiers from Maine, New York, Vermont, Massachusetts, Rhode Island, and Connecticut headed down the road and slowly formed into battle lines. But for the Union troops, as for the Confederates, this was their first battle. Units took time to get into unfamiliar formations, and as new units arrived on the field they sowed confusion in the men already on the battle line. Since some of the Union troops wore gray uniforms, soldiers from one Northern state opened fire on troops from another. And the Union soldiers, who had been marching for nearly a dozen miles since early morning, were exhausted before the battle began. Now, at 10:30 in the morning, the heat of a Virginia summer day began to overwhelm them. The Tigers, for their part, were inspired by their leaders. Their immediate leader, Major Wheat, was both loved and respected by the Irish Zouaves. He would leave the field one of the first Confederate heroes that day. His brigade commander, Colonel Evans, was the one man on the field who understood how key his unit was to victory. The confusion spread throughout the Union forces by this bold move proved more deadly to the Northern cause than the actual casualties that resulted from it. With the Confederate position defended by only a scattering of units, the Unionists delayed advancing again. During the delay, Confederate reinforcements began arriving. The Union army would now spend an hour fighting for strategic land they could have occupied in minutes if the Tigers had not delayed them. Civil War cannons were heavy, unwieldy weapons. The soldiers manning them could not defend themselves against charging infantry or cavalry, and on Henry Hill, they would face both. The artillery batteries, followed by the New York Fire Zouaves, crested the hill, only to see Stonewall Jackson’s well-led forces in line against them. When the Union soldiers saw a Confederate regiment advancing on them, they turned their guns to fire, only to be told by an officer that the men moving towards them were fellow Union troops. During the morning, the Fighting 69th had been out of action. 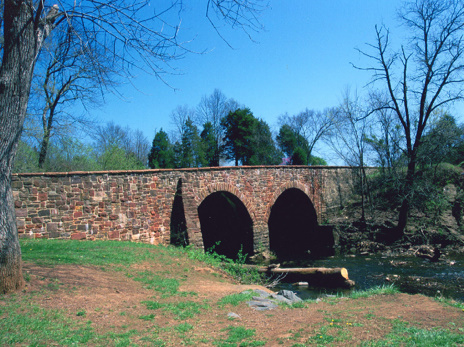 Sherman’s Brigade had been held back at the Stone Bridge. As Union troops began streaming up Henry Hill in uncoordinated attacks—in which a single Northern regiment would be pitted against several Confederate units—Sherman’s brigade moved across Bull Run and towards the fighting. The Union forces paid with their lives for their commanders’ lack of coordination in trying to recapture the batteries. Although McDowell had as many troops at the base of Henry Hill as the Confederates had on it, instead of moving up the hill in a unified fashion, or trying to move around it to force its evacuation, he seems to have simply sent whatever unit he happened upon up the hill to be cut down by the waiting Confederates. Sherman’s brigade moved on the hill in the same fashion as these earlier unfortunates. This Currier and Ives print from the collection of the Library of Congress shows Colonel Corcoran (mounted) leading the 69th New York on Henry Hill. The red-shirted soldiers in the foreground are members of the 11th NY Fire Zouaves. The green flag of the 69th is in the center of the picture. In the background, men of the Irish regiment are shown shirtless, having stripped down for battle. My regiment came off the field in admirable order, and were on the road to Centreville, where I halted to rest. Two regiments that had not been in line and were returning in disorder, hung on my flank, and when the cavalry were seen advancing toward us, these regiments broke precipitately through my lines, throwing us into disorder, and caused a general flight. Ironically, Drury’s own unit, the 1st Louisiana Special Battalion, the Tigers, was itself made up largely of Irish immigrants. Like many Americans on both sides in the war, Private Drury Gibson was blind to the contribution of immigrants to his own cause. Major Wheat was loved by his men because he was not. 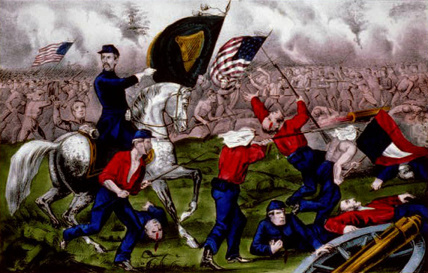 An excellent source of information about the role of Irish in the battle can be found here: Irish in the American Civil War. The blog Bull Runnings provides access to many valuable documents connected to the battle. The U.S. Army makes its guide for officers studying the battle available here as part of its Staff Ride series. A company was the basic unit of Civil War armies. Ideally, a company had around 100 men in it. A regiment consisted of about 10 companies and typically had 1,000 men in it. A brigade was made up of two or more regiments, and a division of two or more brigades. None of these units were able to turn out their ideal strengths for battles due to losses in combat, sickness, and men absent from the units. Most Civil War battles have two names, one given by Union troops and the other by Confederates. Bull Run is the Union name for the battle, but Confederates referred to it as Manassas. I decided to let the web decide what name I’ll use. According to Google, searchers are 10 times as likely to look for Bull Run as they are to search for Manassas. 1. 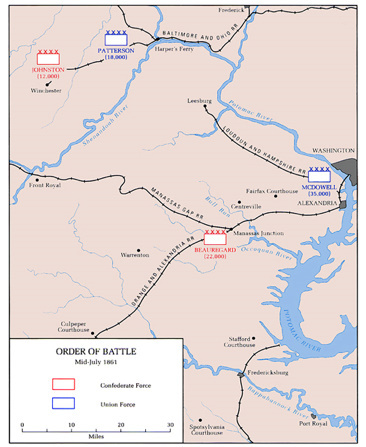 Battle at Bull Run by William C. Davis, Doubleday, Garden City (1977) pp. 66-67; Supplement to the OR-Vol. I Reports Addendum to Series I Vol. 2 pp. 194-195 Rep. of Major Wheat Aug. 1, 1861; Battles and Leaders of the Civil War Essay by P.G.T. Beauregard pp. 196-227. 3. OR Series I-Volume 2 [S#2]-Chapter IX pp. 371-372 Report of Captain James Kelly July 24, 1861. Kelly complains that the 69th were “greatly fatigued” because it was the only unit that was not allowed to transport its supplies by wagon. The men had to carry their supplies. Men of the 69th also criticized Sherman for refusing to allow their sick to be transported back to Washington before the battle. 8. Compendium of C.S. Armies: Louisiana; Lee’s Tigers: The Louisiana Infantry in the Army of Northern Virginia by Terry Jones Louisiana State University Press, Baton Rouge (1987) p. 13. 10. Gottfried, Bradley M. (2009). Maps of First Bull Run: An Atlas of the First Bull Run (Manassas) Campaign, including the Battle of Ball’s Bluff, June – October 1861 (Kindle Locations 660-661). Savas Beatie. Kindle Edition. ]; Lee’s Tigers: The Louisiana Infantry in the Army of Northern Virginia by Terry Jones. Louisiana State University Press, Baton Rouge (1987) pp. 52-53. The knife fighting incident, while undoubtedly true, was also exaggerated in the Southern press and by Confederate soldiers. One account has three entire companies of Tigers attacking with just knives! 13. Gottfried, Bradley M. (2009). Maps of First Bull Run: An Atlas of the First Bull Run (Manassas) Campaign, including the Battle of Ball’s Bluff, June – October 1861 (Kindle Locations 954-956). Savas Beatie. Kindle Edition. OR –Series I-Volume 2 [S#2} Chapter IX, pp. 345-348 Report of Major William Barry July 23, 1861. See also Report of the Conduct of the War Vol. 2 Testimony by Capt. Charles Griffin January 14, 1862 pp. 168-177. 19. LETTER FROM COL. CORCORAN. The Manner Of His Capture By The Rebels. Richmond, Va., July 29, 1861. 21. Gibson letter is available at the Bull Runnings resources page. Previous articleSchumer Trying to Revive Immigration Reform?